More about your local specialist for metal fabrication in Devon. Devon Valley Fabrications was established in February 2001 and is based in Cullompton just off junction 28 of the M5. We manufacture excellent quality gates, railings, metal staircases, balustrades, fire escapes and structural steel. One of our specialities is producing bespoke and one off fabrications specific to the customers requirements. The business is owned and run by Derek Bradshaw who has had over 20 years experience of working in a variety of different manufacturing industries. He started out working for Twyford Engineering in Cullompton where he worked in precision engineering using manual lathes, mills and C.N.C machines. He then gained a lot of trailer experience whilst working for Bramber Boat Trailers in Willand where he worked in all aspects trailer manufacture, parts assembly and servicing. He later went on to be the manager of Admiral trailers where he designed and manufactured a variety of different trailers for the Ministry Of Defence. Later he worked for Double S, working in all aspects of stainless steel exhaust manufacture, this led to the opening for a short while of Culm Valley Fabrications Ltd where he was the managing director, after this he opened Devon Valley Fabrications. 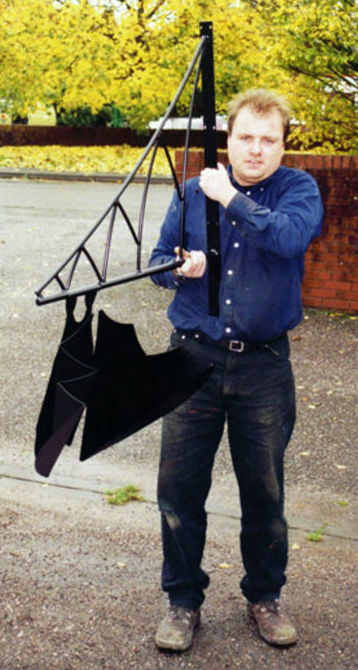 Here is Derek holding one of the eight stainless steel bats that he fabricated for a tourist development scheme in Whitby. We have good sized, well equipped workshops which have enable us to cope with every job that we have encountered to date. We are able to take on jobs that are large or small, for members of the public and commercial customers alike. Risk assessments are carried out and Method statements are written and all paperwork is issued prior to any work taking place on site. We fabricate and weld metal products in mild steel. stainless steel and aluminium to suit the clients needs, in our workshop and on site. We also make repairs and alterations to existing products. We aim to deliver a excellent quality product on time, every time. Wherever possible raw materials and services are sourced locally which reduce costs, lead times and has a smaller impact on the environment.